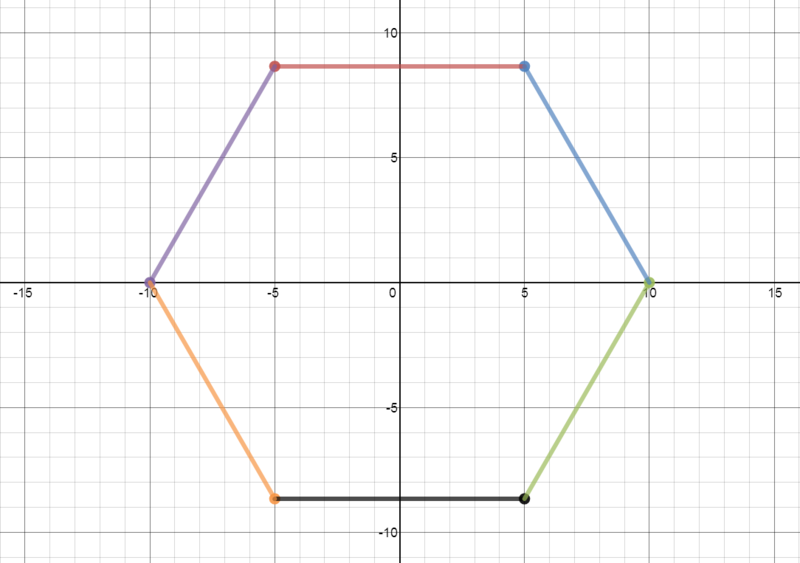 Can you create the following regular hexagon centered at the origin (0,0) with sides of 10 units long using desmos.com or some other graphing tool? If you’re victorious, leave us a note in the comments when you’re done. If you want to increase the level of difficulty, use a slider to allow you to make a regular hexagon of any side length or try constructing another regular polygon! Posted in: advanced, linear, polygons. Tags: linear, polygons. Nicely done! How did you go about finding the vertices (trig, Pythagorean Theorem, or some other method)? Good work! Can you insert a slider so it can become a regular hexagon of any size? is there a way to do this on 1 line ?